…Arnoldi, who also wrote Chemical Pink, about female body building, researches her novels like Hunter S. Thompson researched drugs and Hell’s Angels. The characters in her latest novel share a ‘sense of belonging and yet not belonging’ that the lifelong Malibu resident believes is a central tenet of present-day Malibu. Harry Crews + Joan Didion = … Katie Arnoldi? Katie Arnoldi really wanted to see a mountain lion. 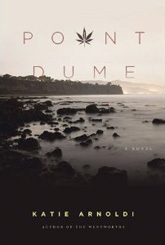 That’s how one seed for her new novel “Point Dume” was planted. ‘Over fifty percent of first-time novelists never publish a second,’ he said.